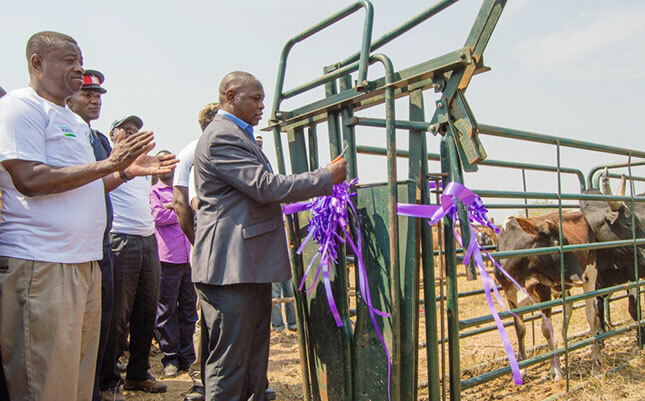 Smallholder cattle farmers in Zambia’s Northern Province were reportedly set to see their livelihoods improve under a recently launched livestock improvement project. Zambeef’s head of retail, marketing, and corporate affairs, Felix Lupindula (front left), and district commissioner of Zambia’s Mbala area, Kedrick Sikombe (right), together with other dignitaries, celebrating the launch of the smallholder cattle improvement project. The project was being driven by a partnership between Zambeef Products, the largest integrated agribusiness and food processing company in Zambia, and Musika, a Zambian non-profit company aimed at stimulating private sector investment in smallholder markets. A statement by Zambeef quoted Kedrick Sikombe, the district commissioner in Zambia’s Mbala area, as having said that the country’s livestock sub-sector had been under-utilised despite being recognised as an increasingly important part of Zambia’s agricultural economy. Zambeef’s head of retail, marketing, and corporate affairs, Felix Lupindula, said that Zambia’s farmers were a vital link for ensuring food security and agricultural development in the country. “If we aim to seriously grow in the agro-processing sector as a country, we must deliberately groom and equip our farmers to compete in the current market where maximised productivity and sustainability go hand-in-hand,” Lupindula said. Zambeef’s statement said that its partnership with Musika would equip smallholder cattle farmers with relevant management skills, and educate them in good animal husbandry practices, herd health and breeding techniques. This would enable them to better manage their resources and maximise their returns. “The reinforcement of commercial relationships between Zambeef and smallholder farmers will result in multiple benefits, with farmers accessing a ready market for cattle, technology and knowledge transfer, infrastructural development, and forward pricing,” the company said. Zambeef added that it already had an established abattoir at Mbala, which was being used as a base for developing a smallholder livestock supply chain in the area. Musika estimates that over 500 smallholder cattle farmers would participate in, and benefit from, this supply chain once it was fully operational. “We hope this will stimulate growth in livestock farming in the region, and that farmers will be encouraged to invest in their production and increase productivity, as well as persuade crop farmers to also consider diversifying into livestock farming or growing inputs for stock feed alongside their usual crops,” Lupindula said.